What’s the latest on the Bonita Peak Superfund District? Last week the Superfund Team, made up of folks from the Environmental Protection Agency (EPA), United States Forest Service (USFS), Bureau of Land Management (BLM), and the Colorado Department of Public Health & Environment (CDPHE), hosted a series of public meetings in Silverton, Durango, and Farmington to discuss planned activities for the 2017 field season and answer questions from the public. Couldn’t make it? That’s okay, we were there. Here’s a recap of the important things they covered. As part of an ongoing Remedial Investigation / Feasibility Study (RI/FS), the Superfund team began sampling water in Cement Creek, Mineral Creek, and Upper Animas drainages in late March, and plan to continue their sampling effort through May to better understand the scope of the problem and identify the most significant sources of contamination. Along with more than 20 years of existing data, the water samples collected this spring will help the team determine what actions would have the greatest positive effect on water quality in the Animas over the coming years. Initiating interim response actions to address simple water management and waste pile stability concerns. Identifying for future action the mine features that may be the most unstable and at risk of unplanned releases of contamination. Identifying for future action the mine features that are significant sources of contamination. Conducting a Human Health Risk Assessment. To address these priorities, the site team has identified 40 potential early actions across 27 different sites that they would like to initiate between now and 2021. These actions will be described and made available to the public in a Proposed Plan in mid-late June and will be followed by a 30-day public comment period. After considering public input, specific actions for 2017 will be chosen and construction is planned to begin in mid-late August. Attendees at all three meetings questioned the availability of funds to support future Superfund work. The EPA confirmed only that funding has been secured to continue sampling and maintain operation of the Interim Water Treatment Plant at Gladstone (currently treating water from the Gold King Mine adit) through the remainder of 2017. Rebecca Thomas, the Remedial Project Manager, said that while she has requested funding for this year’s construction projects, funding has not yet been secured for any early actions or for Superfund work, in general, beyond 2017. In June of 2017 there will be a 30-day public comment period following the release of the Proposed Plan for early remedial actions. We’ll be tracking the process and letting folks know how to engage. 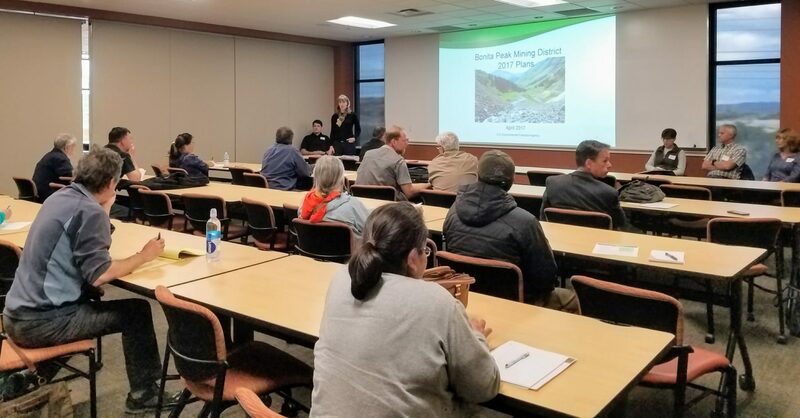 In addition, a series of meetings are being developed by the Animas River Stakeholders Group, the Animas River Community Forum, the Animas Watershed Partnership and others to engage the public in setting some citizen’s goals for the Superfund site this fall. The initial meeting is tentatively planned for late August, and information about the meetings will be made available to the public as soon as possible. Feel free to email marcel@sanjuancitizens.org with any comments, questions, or concerns regarding this latest series of EPA meetings or the Superfund process in general and continue to check the SJCA blog for future updates.